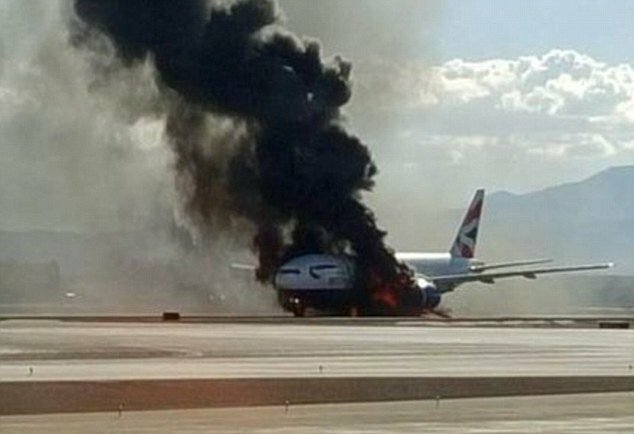 British Airways plane bursts into flames on the runway at Las Vegas airport! Watch the footage here. A London-bound British Airways jet caught fire on Tuesday as it was preparing to take off from Las Vegas, prompting the crew to abort takeoff and evacuate terrified passengers. "There were 159 passengers and 13 crew on the flight," McCarran International Airport in Las Vegas said. It added that seven people on board were treated for minor injuries. The Federal Aviation Administration said the fire broke out in the left engine of the 257-seat Boeing 777 shortly after 4:00 pm (2300 GMT) and the crew immediately aborted takeoff and ordered an evacuation. "Passengers deplaned on the runway using emergency slides and (were) bused to the terminal," FAA spokesman Ian Gregor told AFP. He said a probe was underway to determine the cause.